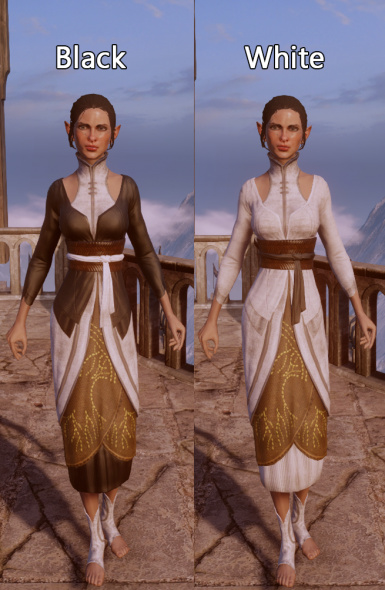 Replacing the inquisitor's pajamas, formal wear, and wedding dress with one of the female elf NPC outfits (dress with turtle neck). Project files for all replacements included. I'd only prefer to be credited if my project file is used because the bundles editing is super tedious lol. It's not necessary but I'll appreciate the courtesy. 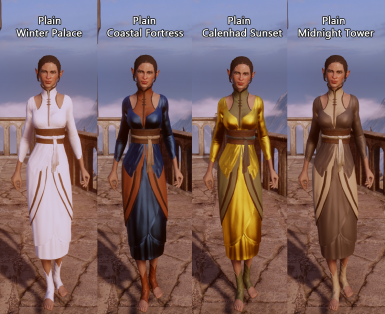 This mod replaces the female elf inquisitor's various outfits with a medium length dress worn by female elf NPCs. This upload turned out extremely modular, so read through the description carefully. - Generally the main files replace the model, the optional files provide texture if wanted/needed. - Of the main files, choose only one of the pajamas, formal wear, and wedding dress files. - Currently, one main file's tinting replaces another one's (for ex. : untinted formal wear on top is overridden by tintable pj on bottom), I'll fix this soon. - You can use pajamas, formal wear and wedding dress at the same time, but they'll have the same texture. 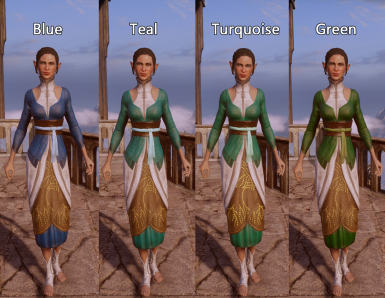 - Use only one optional recolor/retexture at a time. - Crashes during the intro scene where you escape the Fade. Install it once you can save and quit. - Not thoroughly tested, only loaded the mod in some major areas. Please report if it crashes the game anywhere. I'll try to fix things but no promises when bundles are involved. Sometimes they just be mean like that (or an eternity to find the solution). - No Leather: the leather parts are tinted by the cloth material instead of leather. - With Leather: the leather parts are tinted properly by leather materials. The tintable wedding dress is just plain white like the original wedding dress. 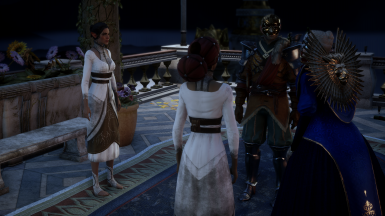 This version doesn't have a tint map, which means any texture you apply to the original dress will appear on the inquisitor as well, but cannot be tinted in-game. 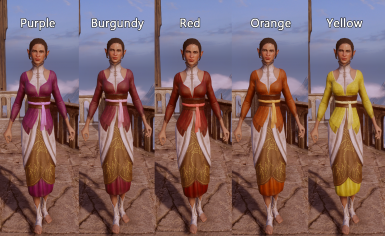 I only recommend this with texture replacements and recolors. I'm terrible at making nice textures, but I'll try to provide some basics. 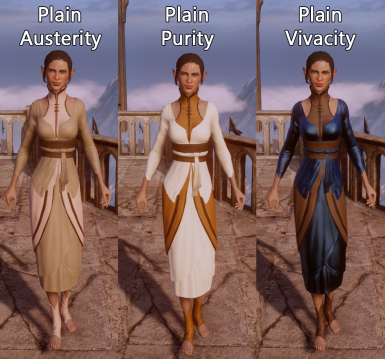 Please use these along with the 'Untinted' pajamas, formal wear and/or wedding dress, unless you feel experimental or it's the 'Plain Tintable' texture, which is actually meant to be used with tinting. You need Frosty Tool Suite to install this mod. For help on how to use, install or create mods, check out the Frosty Tool Suite Discord server﻿ or DAIModding Discord. 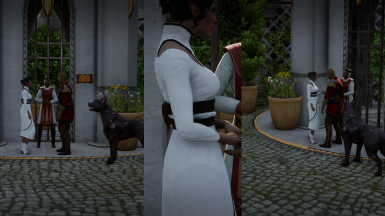 - Skin tone matches your inquisitor's skin tone. 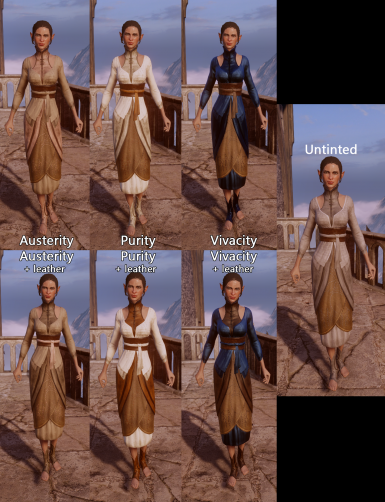 - The tintable versions work with the material tinting mods. - As far as I can tell, works with DLCs, even Trespasser. 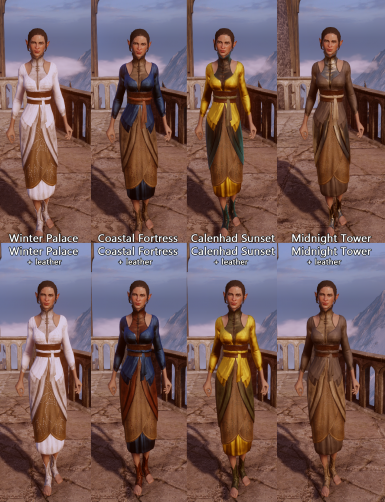 - To use this as an armor, you need to install a visible armor mod, or craft the formal wear. 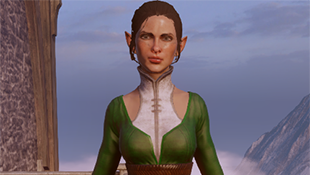 - Affects all elves that wear this dress, randomly generated and pre-made alike, even Briala. 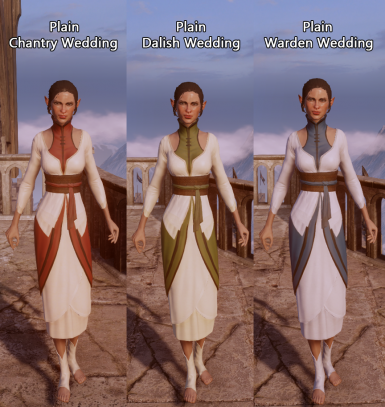 - No idea why the default formal wear tinting is full on white on this dress and not red. Electricfish for her tutorial on how to replace models through bundles and super bundles. It's uploaded here.